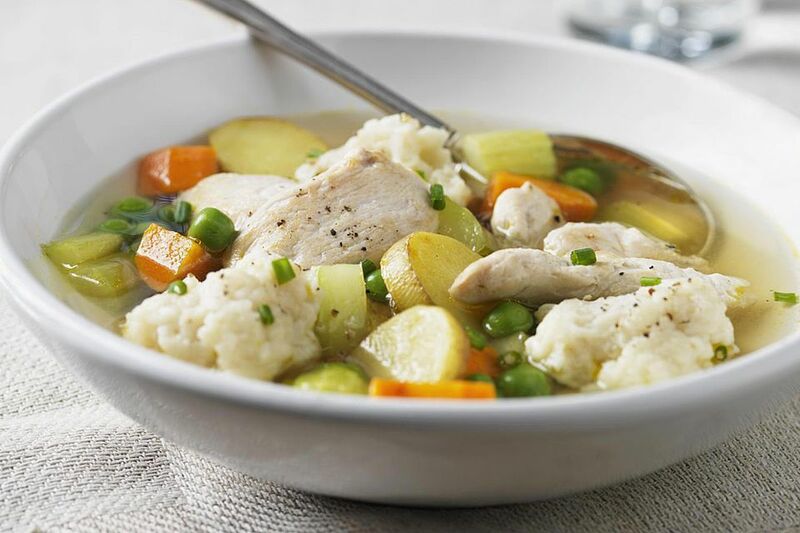 This homey recipe for crockpot chicken and dumplings tastes like something your grandmother would make. The only difference is a homemade biscuit mix that tastes much better than the boxed stuff. Boxed biscuit mixes have a ton of salt, and lots of other ingredients you would probably rather not eat. And making your own mix is much cheaper than buying it! The secret to perfect dumplings is to not over mix the batter and to drop the batter onto very hot, bubbling liquid. That way the dumplings begin cooking immediately and don't get soggy. Cook until the dumplings are fluffy and cooked through. You can test them by slicing one open. It should be hot on the inside with no undercooked or doughy areas. In a 4-quart crockpot, mix the potato, carrots, onion, garlic, and mushrooms, if using. In a medium bowl, combine the chicken broth, flour, salt, thyme, and pepper, and mix until smooth. Pour this mixture over the vegetables in the crockpot. Add the chicken on top; do not stir. Cover the crockpot and cook on low for 6 to 8 hours or until the chicken is thoroughly cooked and no longer pink in center. The temperature should be 165 F on a meat thermometer. Add the peas to the chicken mixture and cover again. Cook on high for 20 minutes until the peas are hot. In a small bowl, combine the baking mix with the chives, milk, and melted butter, and mix just until combined. Do not over mix. If you don't have any baking mix, combine 1 1/2 cups flour, 1/2 teaspoon baking powder, 1/2 teaspoon salt, and 1 tablespoon snipped chives in a small bowl. Melt 6 tablespoons butter and mix with 1/2 cup milk; add to the flour mixture and stir just until combined. Drop the dumpling dough by tablespoons onto the hot, bubbling chicken mixture in the crockpot. Cover the slow cooker and cook on high for 20 to 25 minutes until dumplings are cooked through, fluffy, and a toothpick inserted in the center comes out clean.